I was given the excellent OctaPentaVeega - Arduino VGA shield by Jari Tulilahti. For a long time it sat on my Arduino-related hardware pile, since I was kind of busy with other projects - like the dual hardware speech synthesis box. One of the synths was in my drawer for about 20 years before I got around to actually finishing it. One day I might even document it. 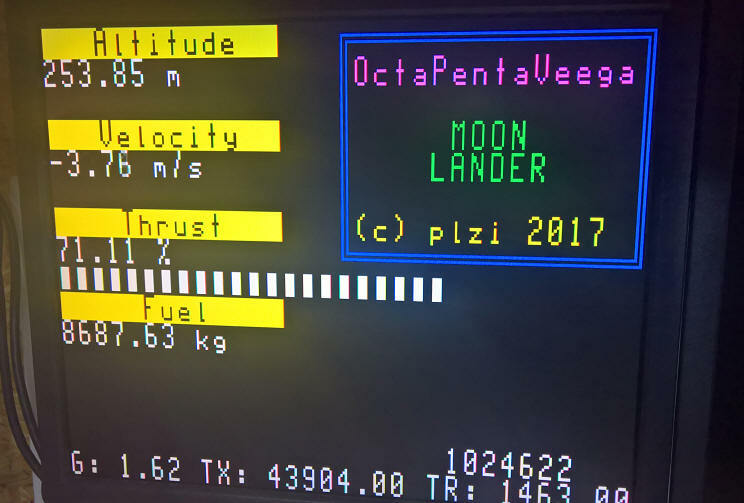 After some initial fumbling and mucking around, I finally came up with an idea what to do with it - the 1-dimensional text-based Lunar Lander simulator. Yeah, some snazzy IoT home automation display project would probably have been way cooler, but I like retro-y things, so Lunar Lander game it is. World is filled with temperature displays, anyway. Ultra-minimalistic user interface. It consists of one (1) potentiometer, so that box is checked. At least one UI element that looks like graphics (there is a bar which shows the current thrust of the lunar module). Picture below shows the UI all its g(l)ory. Please disregard the debug measurements present on the display. The related hardware schematic is below. Pot in my circuit is A10K (linear 10 kilo-ohm). OctaPentaVeega is a cute little board with three attiny85's. Since Jari is a true embedded systems expert (unlike yours truly), his card generates the VGA timings and signals by software. With unbelievably small memory footprint. 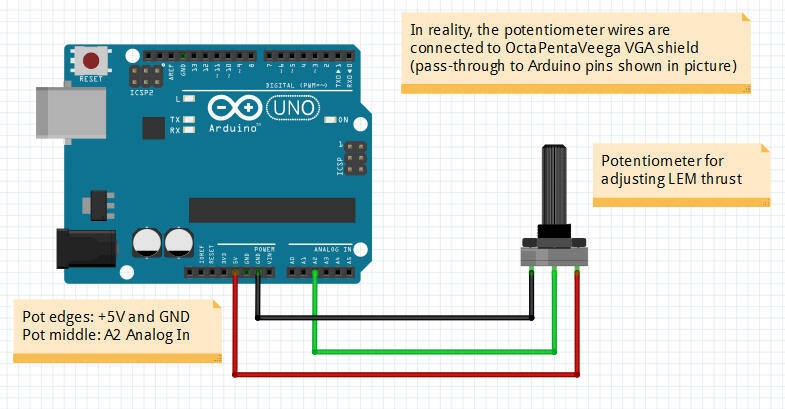 From Arduino-amateurs point of view, the board is quite simple. Board generates a 640x480 standard timing VGA picture. The picture consists of 16 rows and 32 columns (numbered from zero). The data is fed from Arduino to OctaPentaVeega through one pin, as a SoftwareSerial port, 9600 bits per second. The data itself is ASCII text - but some ANSI codes are supported (so you can, for example, change colors or move the cursor). There are also mechanisms for rudimentary scrolling (line or screen, but to one direction only). There is a "graphics" mode which somewhat resembles teletext - so no graphics primitives (lines, circles or so on), just byte-mapped blocks. And finally, in the running code we just send data to the serial port with write(), print() or println(). The code for the Lunar Lander is below. Yes! Global variables absolutely evrrrrywhere! Also my BASIC history shows in more ways than one, none of them good. Awful all around, but it seems to work. I've tried to comment every relevant section. The game is played with potentiometer - I used standard linear 10K pot, but I feel the game would be better with a long-throw pot slider. Standard pot does not have very precise control, something with wider range would be better. The thrust is applied as it would be on the real LEM - I've been told that the engine throttle rate was 3 seconds from idle to maximum thrust. This is simulated in the program with thrustrate variable. Once the LEM reaches moon surface (altitude is zero), the game ends. Desirable outcome is to land with velocity less than 2m/s. Program comments about better (and smoother) pilot performance, though. Game is reset when player moves the potentiometer to both extremes (min and max setting). I would like to include some graphic representation about g-forces and altitude, but the relatively slow interface between Arduino and OctaPentaVeega may prevent this. Maybe in the next version. SoftwareSerial vga(9, 8);   // We are talking to OctaPentaVeega through pin 8. // Pin 9 is unused as the shield does not respond. // Some static stuff for drawing a box on the UI - codes are graphic characters. // Time constant for physics calculations. // but since we spend most of the time outputting things to screen, I did not bother. // a switch to control the thrust. velocity = 20;  // velocity should be more, but hey. // Draw initial screen content. void UpdateStats()    // the awful physics simulation. Ooh! Eleetti ROT-13 -koodaus mIrc-asiakasohjelmalle. Furrfu. Router Blackhole List -testi toteutettuna VBScriptillä. Base64- enkoodaus ja dekoodaus VBScriptillä. Ikivanhoja Borlandin kääntäjiä ja tyäkaluja. Pascalia, Basiccia ja C:tä. Skripti Powerpointille - soittaa cd-levyä esityksen taustalla. Example script on how to get game status information from Unreal Tournament Server (UT99) within an ASP page. Uses .NET. Speakjet SuperCarrier PCB manual. Speechchips.com had removed this one from the web, so here it is for the sake of completeness. Teensy/Soarer PS/2-USB-konvertteriprojekti. Kuvia ja huomioita. Raspberry Pi Zero W:stä infocomin seikkailupelejä pyörittävä minimalistinen wlanissa keikkuva kone. Small vbscript to print folder structures.